“The percussion act was a fantastic addition to our program, friendly percussionists, experience with children so in our opinion a great combination. For a spectacular opening act, whether or not in theme, an act with these professional and creative percussionists suits very well. These percussionists can also play on different objects: not only ordinary drums and percussion instruments, but also, for example, bok boxes, oil drums (barrels), garbage bins, scaffolding pipes, buckets, car rims, steel sheet piles, etc … Whatever you wish! 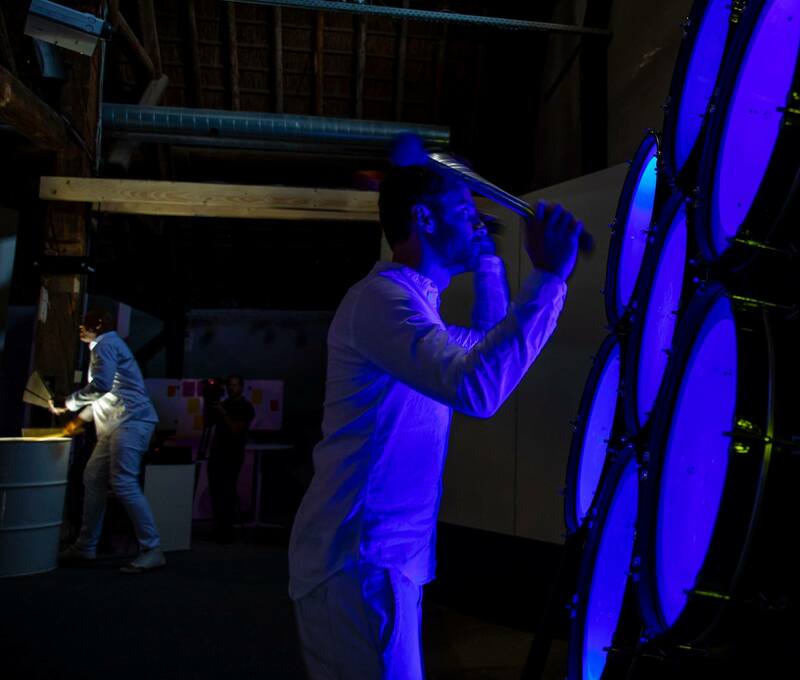 Think of a drum act with splashing water in blue light or black light or an opening act where the director of the company can play drums on extra-large bass drum and giant djembe, before he makes his speech … 100% success guaranteed for every kind of occasion. This opening act can also take place outside, amplified or unamplified and can also take place in (partly) mobile. 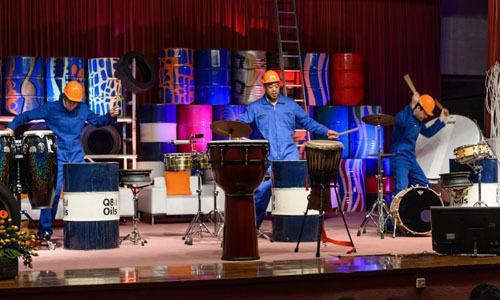 A percussion show with drums, drums and other traditional set-ups are possible, also in combination with an accompanying tape with music or electronic beats. Because we have our own studio, orchestral bands can also be customized with sounds that represent your company or event! 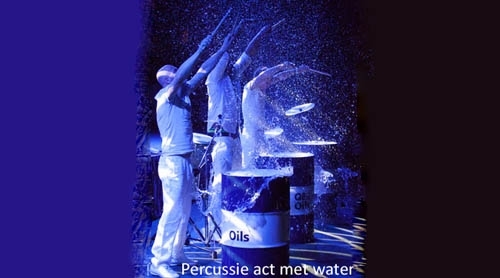 Starting with 3 percussion players on oil barrels with reactive LED lights and nice drums’wall’ with reactive LEDs, accompanied by backingtrack with beats and sounds (for example in theme ‘water’ and splashing water from the drums). They will look for participation with the guests, clapping their hands, some body percussion and the first part of this show ends with a clear ‘BAM!… applaus…(4 minutes). Then the lights dim…. 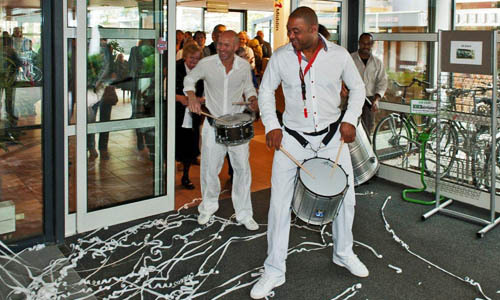 percussion players play an exciting drum-rumble…. Then 2 Visual LED poi performers come on stage and an absolute WOW-act starts! Think of your own logo or text in the show? We can integrate words, logo’s and (short!) slogans in the show. everything in full color! 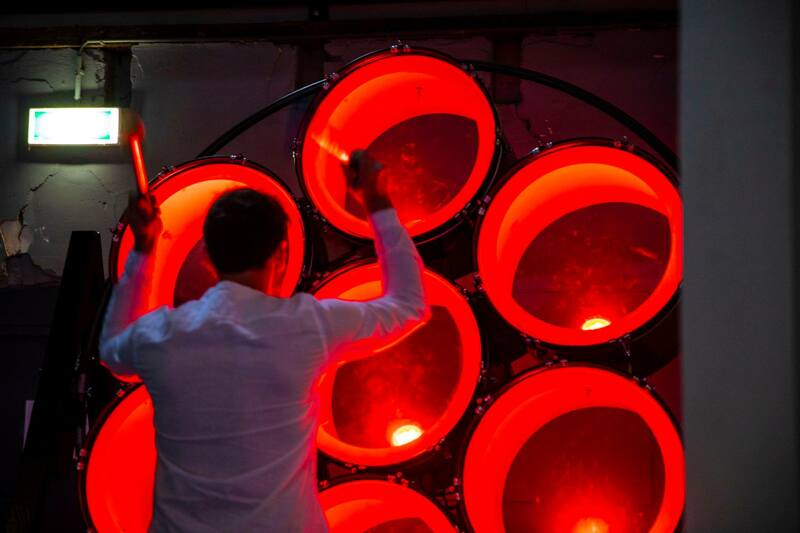 Percussion players play along with backingtrack of this showact for a full LED show experience! StringCats Electric Violin Duo and / or Visual LED poi dancers. A Brazilian brass band as opening act, possibly in combination with Brazilian dancers / Capoeira – the Brazilian dance. African drum opening act with Djembé drums with African dancers, if desired, with Antillean percussion opening act and Brass band. A brass band is a group of percussionists in combination with brass players, trumpets and trombones. 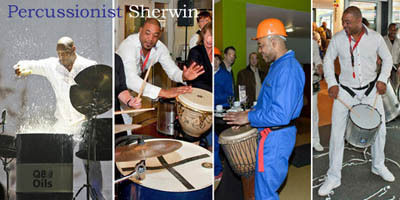 An opening act or final act with mobile drummers, running percussionists, can be used in different settings. If desired, Buro van Otterloo can also customize the company music for you and thus provide the accompanying tape, orchestral band.